I’ve decided I’m going to do an inspiration post every Wednesday(even though today is Thursday – was out last night for a friend’s birthday AND you know you’re truly a thirty-something when 8 people share a bottle of wine! Scary.). It’s halfway through the week and I’ve so many things that are of interest to me at the moment and I’d like to share them. 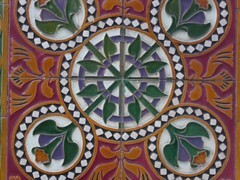 These tiles are outside The Flask pub in Hampstead. The pedestrianized street, Flask Walk was known for its sellers of spring water for three pennys when Hampstead used to be called Hampstead Wells. I think they mean in the 1800’s. Anyway, I love the colour combinations – green and purple and red with orange.